What is the brown skin stain / haemosiderin on my legs? What is the brown stain on the skin around my shins? What is haemosiderin staining? What is Haemosiderosis / Haemosiderin staining ? While this FAQ will deal primarily with haemosiderin staining in the skin of the lower leg, it can occur in other tissues as well. Haemosiderin staining is particularly common on the front of the lower leg in older people. It ranges from yellow to rusty brown in colour and has both local and systemic causes. The brownish stain is a deposit of iron-rich pigments (dyes) that comes from the breakdown of red blood cells. Red blood cells (known as erythrocytes) move into the tissues of the leg most commonly due to elevated pressure within the veins (venous hypertension), long standing vein problems (chronic venous insufficiency) and is worsened in the presence of long term swelling (oedema). As the blood cells decompose into their component molecules, the haemosiderin builds up in the fluid between the cells (the interstitial fluid) of the skin and subcutaneous tissues and literally dyes the tissue. The effect of the dye takes a very long time to dissipate and indeed, more has usually been added in that time, meaning the stain never seems to fade. While the staining is not dangerous in itself, it does indicate a poor blood flow return system which can have other associated problems, such as veinous leg ulcers, veinous eczema and DVTs. 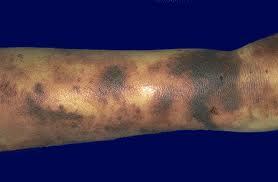 Also, the pathology that leads to haemosiderin deposition is inflammatory and may cause an accompanying dermatitis. Where the inflammation is longstanding, melanocytes proliferate and produce melanin deposits which is called melanosis. These are usually a lighter brown colour than haemosiderosis, can be difficult to distinguish from each other and often coexist.